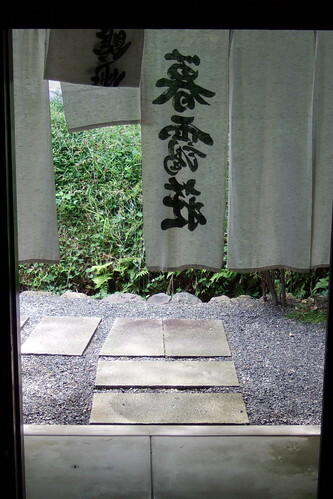 Photo: Entryway of Boai-so, a soba and tempura restaurant in the Arashiyama neighborhood of Kyoto. It has been a lovely morning despite the guilt I feel not doing much productive work in the new house while my husband is in an office doing that Navy stuff he does. I checked out Daily Kos, watched Prop 8–the Musical. A comment on that thread directed me to Neil Patrick Harris in Dr. Horrible’s Sing-Along Blog. Then I remembered and read some more Dispatches from Roy Kesey, An American Guy Married to a Peruvian Diplomat Living in China on McSweeney’s Internet Tendency. All the videos and readings were delightful. I drank Coca-Cola (the hard-core stuff) that we bought because we were having a big family party and some people would be driving. Otherwise we wouldn’t have it in the house because I tend to drink it. All. Carlos introduces me. They tell us about the previous owners of the house: conservative, Southern, not entirely happy living in Northern Virginia, she a “natural gardener.” I tell them I like plants you can eat. They speak of dead heading the perennials and I feel panic rise. I was thinking a few basil plants would do. We agree to show them ours if they show us theirs. They laugh and say they can see well into our house anyway. I have to remember to draw our newly hung curtains at night. The delivery man emerges from the dark, rolls our vent hood into the house, and drives off in that rattling, empty truck. The guys head off to buy a Christmas tree; we walk to the butcher to buy the duck and pork belly Carlos ordered to make cassoulet this weekend. Good first meeting. At family gatherings I am asked, “You miss Japan, huh?” I do. Now I love that we’re ordering meat from the butcher and talking neighborhood history and picking out paint colors and having a vent hood put in, but it’s difficult to express the loss I feel having returned from five years in London and Yokosuka. Roy Kesey’s dispatches from China reminded me of that feeling of adventure and strangeness that becomes addictive. I crave the everyday newness of a foreign country. I miss speaking Japanese. At this point in the conversation someone will suggest I find a language group to practice Japanese and I say, yes, of course. But it’s the otherness, the dream state of living in a foreign country—you are yourself and yet you are someone else—that I miss. There I was Studying Japanese or Tasting Sake or Soaking in an Onsen. Even in English-speaking London, we were Having a Pint at Our Local or Taking the Train to Scotland. Here, in Virginia, I am definitely the regular me, with all my regular characteristics: unevenly ambitious, Coke-swilling, indulgent me. And if I cannot conjure a Rilkean poetry out of our new household adventure, I will have failed myself. I dread the guilt and the failure. How to invest the arrival of the vent hood with the same frisson as an entry into an unknown soba restaurant in Kyoto? After all, observing the mechanics of the process by which the contractor will hang the machine and construct a soffit (a new vocabulary word! I’m learning a new language! ), the satisfaction of having a good vent hood under which I shall fry and sear, these are solid experiences, are they not? I shall persevere through this banal nostalgia for the exoticism of the East and embrace the Christmas lights, the raking, the dead heading, and the vent hood. Onward! James Joyce once wrote of the little sacraments of everyday life. I get the impression that you, madam, understand that. For you, perhaps, every meal is a sacrament. A sad part about American life is that the little sacraments have turned into a meaningless ritual, or at worst, a thoughtless, automatic habit. Habits can comfort us, but not fulfill us. Living in another culture forces you to think about life’s rdinary, mundane things. The stuff that creates our daily lives, and ever so subtly, confirms our view of the world. Japanese often complain that their rituals of etiquette are so numerous and silly that they’ve become meaningless. I wonder if that’s really true; in most cases, at least those rituals force you, consciously, to think about those around you, and how you affect them. Maybe the Fedex guy calling ahead was a little sacrament of everyday life. A habit of his, to be sure, but one which honoured you. Ritual respect, like the gift a Japanese would carry on the rare occasion he is invited into someone’s home. The walk around DelRay showed that you bring back to Virginia a foreigner’s eye. Not taking the ordinary for granted. Does it not seem new again to you? For how long? Has your experience abroad opened your eyes to some truths about home? Forced you to think about things you used to do without thinking? Forced you to reassess what’s valuable and what isn’t? Celebrate your sacraments where you find them. P.S. Many thanks for your kind email. A punishing work schedule kept me from blogging and reading as often as I’d like. I intend to catch up over Christmas. Madam says: Well, holy hell dude, now that’s a comment. Too much to think about and answer at once, some future blog posts will cover some of these questions. Thanks so much for the inspiration.